The Vegetation Dynamics Development Tool (VDDT) is a user-friendly, Windows-based computer tool which provides a state and transition landscape modelling framework for examining the role of various disturbance agents and management actions in vegetation change. It allows users to create and test descriptions of vegetation dynamics, simulating them at the landscape level. Projecting changes in vegetation structure and composition over time is an important part of landscape-level analyses. Vegetation may change for a variety of reasons, such as human activity, fires, insects, pathogens, mammals, weather, or growth and competition. The interaction of these factors is complex and the combined effects are difficult to predict over long periods. 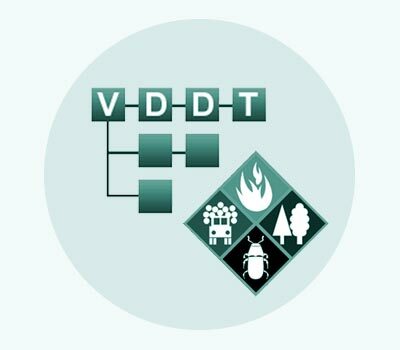 VDDT provides a common platform for specialists from different disciplines — e.g., entomology, pathology, fire ecology, silviculture, wildlife biology and ecology — to collectively define the roles of various processes and agents of change on landscape-level vegetation dynamics. Moreover, VDDT allows for rapid gaming and testing of the sensitivity of the ecosystem to alternative assumptions. It thus provides a means for learning and communication. Vegetation Dynamics Development Tool has been used extensively by LANDFIRE to define reference condition models for the entire US. It is being used by The Nature Conservancy, Parks Canada, the US Forest Service and others to help define the pathways and transition probabilities for the different terrestrial vegetation communities. For more information on VDDT, please contact the Software Coordinator.